Hi guys, mid-autumn festival is coming soon. Beside of buying these grilled moon cakes (bánh trung thu nướng) outside, why don’t we together make at home. It will be more delicious and healthier. Came from many stunning Vietnamese Food Recipes, it is quite difficult more than soft moon cakes in processing, but it is not too hard to make. Trust me, if you have enough patience, you will create many amazing grilled moon cakes for yourself, family and even as a special gift for your friends. You should follow our instruction carefully from ingredients to process to create one of amazing Vietnamese Food Recipes like this. So, are you ready? Now, let us start cooking right now. 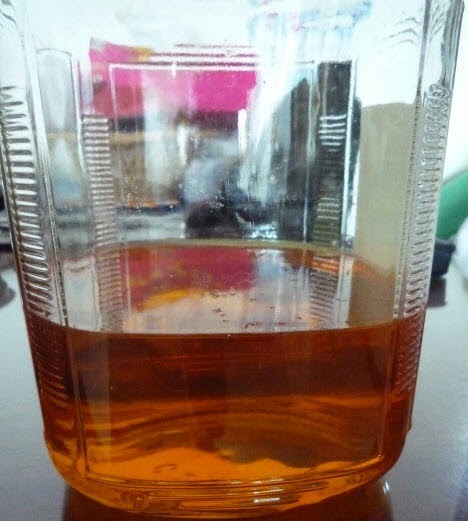 Step 1: Add 1 kg sugar into 1 liter water, stir well. Step 2: Put on cooking stove, cook until it boils; turn off the heat. You should not stir when boiling. Step 3: From my cooking experiences of many Vietnamese Food Recipes, for helping to keep moon cakes longer, after cook mixture sugar in 20 minutes, you add more lime juice (1 fruit) into pot and continue to cook more than 5 minutes and turn off the heat. 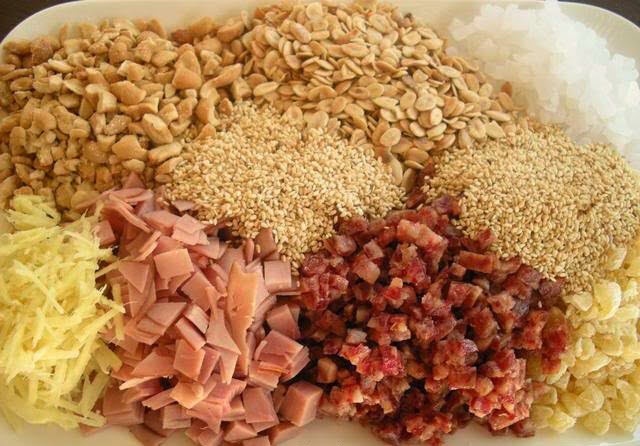 Step 4: Mix all ingredients for fillings together. Step 5: Soft moon cake flour is the adhesive, so after mix all ingredients of fillings together, continue to add this flour and knead well. Step 6: Separate into small cubes (depend on your flavor). Step 7: Clean gently yolks of salted eggs, do not break it. Soak them into mixture white wine with some sliced ginger in 4 – 5 minutes; next bring to steam in 10 – 15 minutes. Step 8: Pour wheat flour into big bowl, add oil, nước tro tàu and sugar syrup on the center. Knead gently and well until it is soft. Step 9: Separate into small cubes equally. Roll thinly and add filling with 1 yolk of salted egg on the center and cover it well. Step 10: Spread a little oil around moon cake pattern edges. 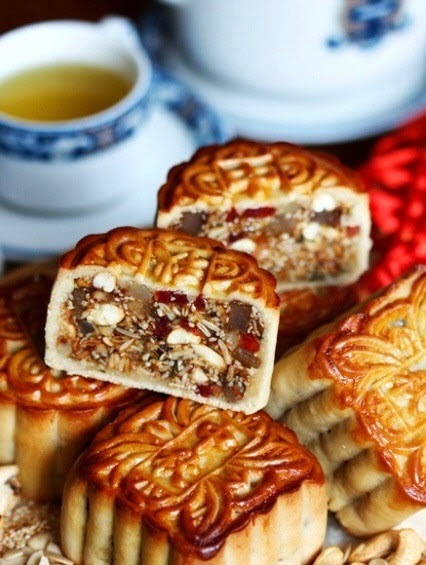 Next, put one by one moon cake into pattern and push firmly, especially around the edges. Then, strike strongly to get moon cake out of pattern. Step 11: Mix 2 yolks with 10 ml water. Step 12 : Set up the heat of grilling stove about 200 – 210 degree in 4 – 6 minutes before grilling cakes. Arrange moon cakes on tray added oil; bring them to grill in 5 minutes. Next, put them out quickly from grilling stove, spray a little water on cakes and wait for 5 minutes. And then use small brush to spread mixture yolks in step 11 on top and bring to grill again at 220 degree in 3 – 5 minutes. 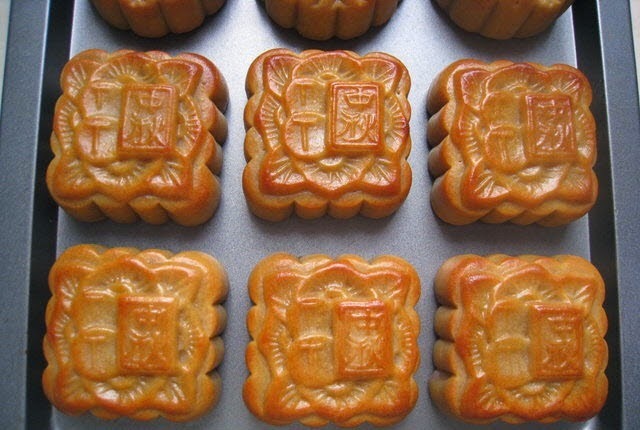 When moon cakes turn brown yellow, turn off the heat and get them out. Finally, you basically finish one of amazing Vietnamese Food Recipes from us. 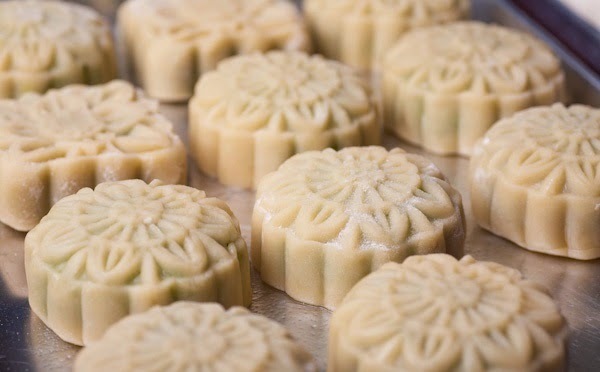 Beside of this filling, you can make grilled moon cakes with mung bean fillings (bánh trung thu đậu xanh nướng) or any bean you love. Bring them to steam and grinded well. Then mix with a little sugar and you can have other stunning fillings for moon cakes as you want. Hope yoi will satisfy with this recipe. Any question, feel free to ask us right here or at our facebook page. Good luck for your cooking.